in the opinion of the people who read Making A Mark. The main reason people tend to buy a painting is "because they like it". 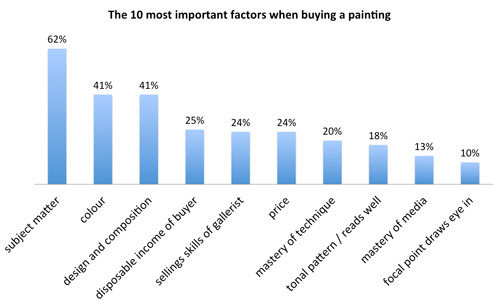 However PRICE was rated as the 6th most important factor influencing a purchase - and it's even more important than technical skill in painting and mastery of your media! Work on your mastery of pricing methodologies because, when it comes to selling art, pricing is more important than the technical skill used in painting! What you think is really important is NOT what those buying your art think is really important. Many artists invariably think that mastery of technique is what's really important in selling/buying art. AND there are several other factors which are even more important! These charts are based on one of the monthly polls I conducted on my blog in 2011. 153 people responded. 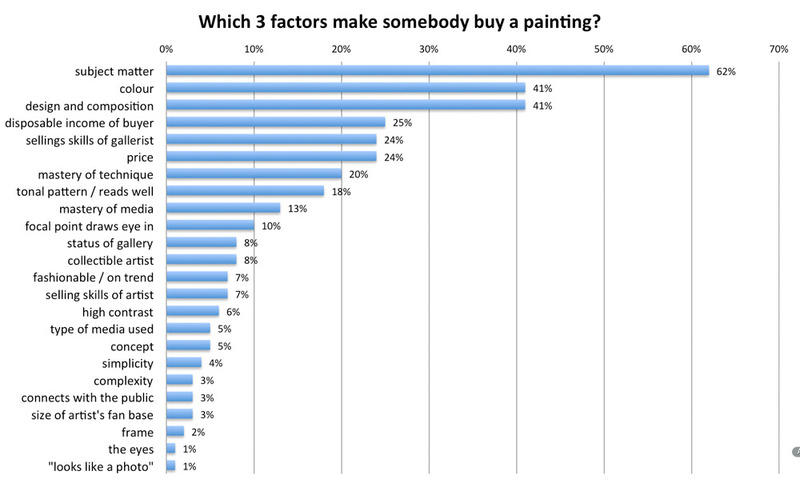 This is a chart from a previous poll I ran on another site which asked artists to think about what was the most important criterion influencing how art should be priced. ​The bottom line is what artists think is important is NOT what is actually important.